Streamlining your ​critical events operations in one focused, solution. At GruupMeet, we believe that successful meeting and incentive experiences hinge on simple, effective and smart communications. GruupMeet helps keep fast-paced planning teams AND attendees connected. Using GruupMeet’s dashboards, teams benefit from live updates, centralized data, and automated 2-way text messaging. GruupMeet, Inc. is supported by the world’s only B2B micro-fund, Tech Wildcatters, and by entrepreneurs who founded one of the world’s largest communications companies. GruupMeet has received numerous industry accolades and honors, including being recognized as one of Dallas’ Hottest Startups in 2016, 2017 and 2018. Some of the industry's leading brands rely on GruupMeet. Effortlessly collaborate with all your event organizing teams. GruupMeet seeks to listen to customer feedback. We always listen and do what's best for our clients and always have, from the start. Today’s event teams and attendees are tired of inefficient mobile app notifications and disruptions. 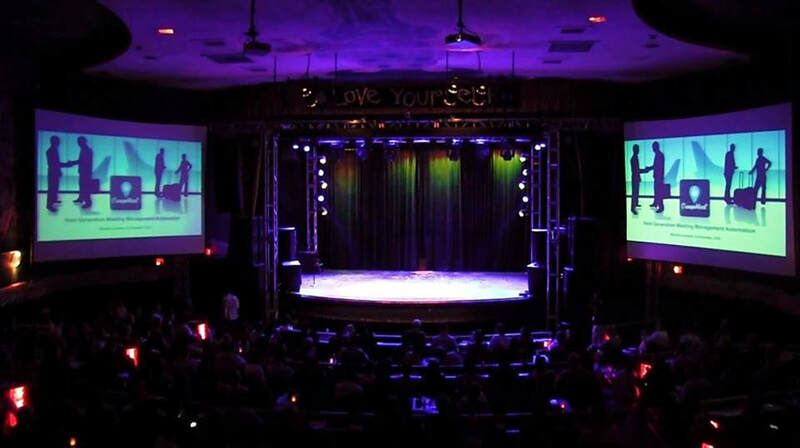 They seek convenience and timely, relevant information without having to change the way they already prefer to communicate before during and after your event. GruupMeet streamlines communications and logistics across all your events in one beautifully designed, intuitive platform. Seamlessly search for flights, guests and see live updates across all your programs. Convenient alerts and notifications keep event organizers, on-site staff and guests informed on several types of devices, so no details or people get lost along the way! Organize deceivingly simple, yet insanely powerful logistics. 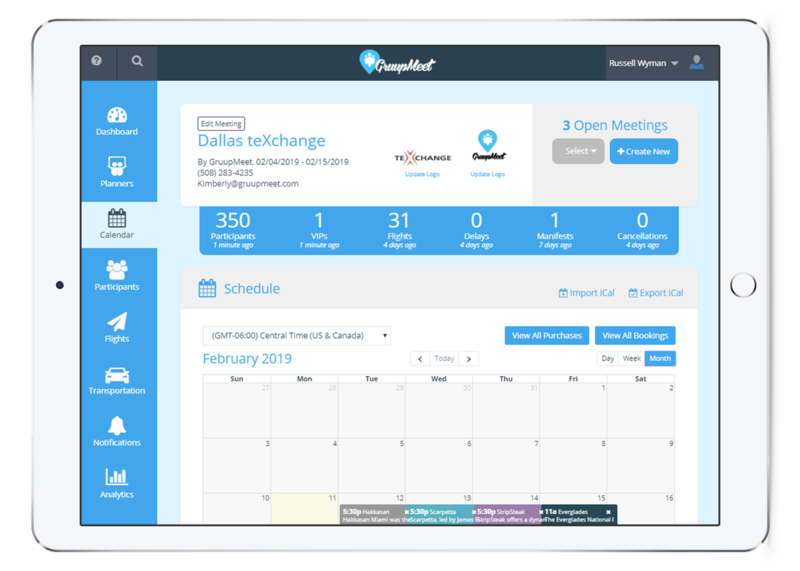 GruupMeet is not a marketing tool - it's a communications platform to ensure that your client's on-site meeting experiences are smooth and successful. GruupMeet's all-in-one, white-labeled platform manages critical flight tracking and real-time logistics data. 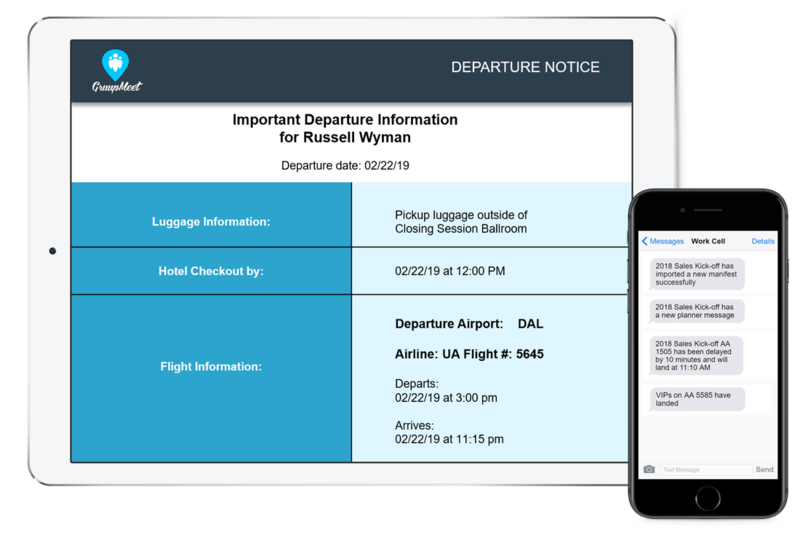 GruupMeet’s automation enables event teams to deliver personalized and timely transportation notifications, tour reminders and important service-related communications like departure notices. Based on client success, we recently launched a seamless add-on solution for tour and dine-around ticketing and registration. No need to worry about any resizing or reformatting. No tech skills required. You don't need any HTML knowledge. GruupMeet's mobile-optimized single-page checkout makes it easy to sign-up on all devices. While the tool is working, it's automatically syncing with GruupMeet's logistics and messaging features, so all the critical details are in one simple, convenient, online solution. You'll have more time to focus on executing flawless programs. You’ll also have better events data. Flight updates and real-time logistics details in one, beautifully designed system. Planner text alert messaging for on-the-go convenience. Automate the critical program emails and communications so attendees have relevant and convenient information. No more PDF airport tip sheets, paper departure notices or inconsistent program communications. GruupMeet's Shared Schedule/Calendar Feeds allows you to easily synchronize your details (OR share program PDF files) across multiple calendars. The booking add-on offers a beautifully designed and seamless private-label solution for reservations related to tours, activities and dine-arounds. No HTML or editors required. ​In 15 minutes or less, our Director of Customer Success, Kimberly Sawyer, will help you get clear on the exact challenges you need to overcome to optimize your company’s on-site services experience to help you win more business. If you’re a great fit for one of our exclusive on-boarding programs, Kimberly will invite you to explore your best options. To book a call with her, just click the button below. GruupMeet joined Tech Wildcatters' nationally-ranked B2B accelerator in 2014. This strong network of technology Founders and mentors helps us continue to thrive. Our team’s average tenure is 4+ years with GruupMeet. Our Director of Engineering has been with GruupMeet practically from the start... This helps us maximize client budgets and effectively and efficiently manage updates and new features. GruupMeet continuously enhances its product features based on our client's feedback. When you are successful, we’re successful too! You have 10 seconds. Why would I use this? GruupMeet keeps teams AND attendees connected. You want to work more effectively and efficiently, enhance customer service and eliminate the back-and-forth of managing Excel updates and using email. Got it, but what’s so great about this tool? GruupMeet is the tool that brings your entire team together on one platform - allowing you to collaborate and work together no matter where you’re located, or what device you are using. GruupMeet streamlines communications and logistics through managing all your event details in our beautifully designed, intuitive platform. No downloading or installing required, so attendees don’t have to worry about keeping up with anything. Why Do you Focus on Event Logistics data? Flights data impacts event staffing, communications, vehicle scheduling, hotel check-in and the overall meeting expectation or attendee experience. We focus on travel manifests to eliminate the frustration of re-checking and organizing this critical data.